What do you get when you combine the design of an airplane and the design of a car? The Terrafugia flying car, of course! This “roadable” aircraft is for real and not just a creation of an imaginative mind immersed in the world of science fiction. Neither is it a mere concept car. 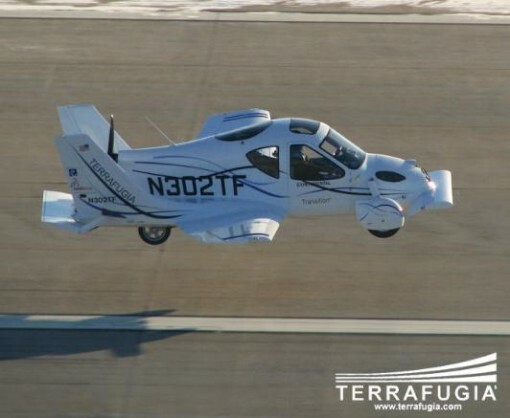 The Terrafugia Transition is a light airplane that can take to the roads just like normal cars do. Imagine this. You are late for work, together with everyone who lives in the area. You have a presentation to give, which can make or break your career. You absolutely have to get to the office but the traffic is as thick as molasses. You can either take a hike – literally – or be late. That is, if you do not own a Terrafugia. If you have one of these babies, then you can simply fly over the masses stuck in rush hour traffic. Zoom in the air without the limitations of the roads and laugh at them suckers for having regular cars. First, you have to wait for the roadable aircraft to be manufactured, though. They were supposed to be delivered in 2009 but you know how it is with new things. Delays are inevitable, and the Terrafugia is not exempt. A new batch of test machines are being built and the manufacturer says that this year, we might just see production start. There is the issue of price, of course, as one vehicle will cost you $250,000. Then again, for a vehicle that can hit the pavement as well as fly in the air, the price is not so bad, is it? There is another problem, especially for those who are looking for a means of transportation that can carry several people. The Terrafugia can fly with a maximum weight of 330 pounds. That includes the passengers AND the payload. Look to your right. Now look to your left. Do you think you and your co-workers can work out a carpooling scheme? 330 pounds isn’t a lot these days! In spite of the issues, the Terrafugia might just become the granddaddy of flying cars that future generations will take for granted. In the meantime, start saving money and losing weight to make sure the Terrafugia works out for you when it comes out!